The Syracuse University Enactus Program will host its first benefit concert on Saturday April 4, at 6 p.m. at 3fifteen, a trendy consignment store located in Marshall Square Mall. The benefit concert is a community event where influential brands and artists on campus will come together to raise proceeds to support the efforts of the Rescue Mission in ending hunger and homelessness. 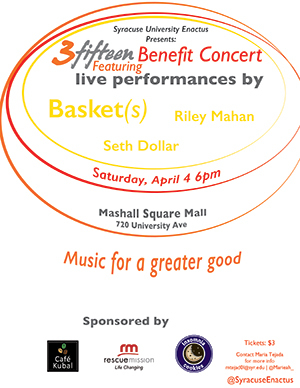 The benefit concert will feature performances from some of the most promising acts on the Syracuse campus: Basket(s) and Riley Mahan, and a special guest appearance from local artist, Seth Dollar. Basket(s) is an experimental indie folk band formed at Syracuse University by singer-songwriter, James Yu. The band has played numerous live shows throughout the Syracuse area, including at the Westcott Theater, Spark Contemporary Art Space and Goldstein Auditorium. It has also opened shows for indie artists such as Magic Man and Panama Wedding. Their music can be found here. Riley Mahan is a second-year acting major at Syracuse University. With roots in classic Motown, Riley is a singer-songwriter with a unique style of indie/soul. Mahan is currently working on new material, but in the meantime, you can watch her wonderful take on Adele’s “Daydreamer” here. Seth Dollar will also be joining Basket(s) on this evening for a special collaboration. Seth Colton, better known by his rap alias, Seth Dollar, is a Syracuse native hip-hop recording artist and co- founder of Children of the Summer, a contemporary entertainment company under which he released his latest installment, “It’s Only Right.” You can find out more about Children of the Summer here. Insomnia Cookies, Café Kubal, Rescue Mission and 3fifteen are the official sponsors for the concert. Snacks and light refreshments will be offered, along with a variety of activities throughout the night, including a raffle to win Chipotle gift cards and tickets to see comedian Wanda Sykes at the Crouse Hinds Theater. Tickets for the 3fifteen Benefit Concert can be purchased directly from an Enactus member or from the artists. Tickets will also be available at the door on the day of show. The Enactus Program is a global nonprofit organization that connects students, academic and business leaders through entrepreneurial-based projects that empower people to transform opportunities into real, sustainable progress for themselves and their communities.